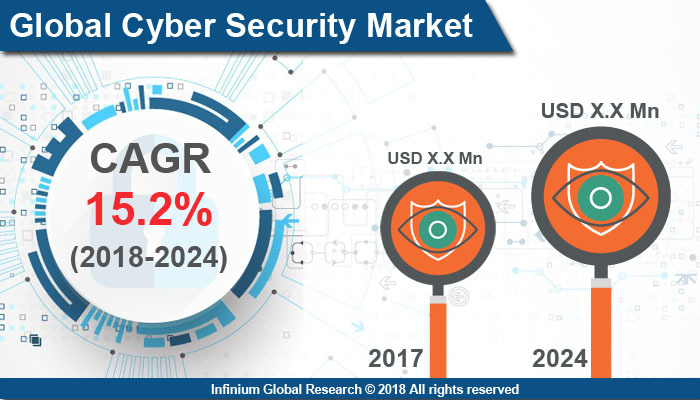 A recent report published by Infinium Global Research on cyber security market provides in-depth analysis of segments and sub-segments in the global as well as regional cyber security market. The study also highlights the impact of drivers, restraints, and macro indicators on the global and regional cyber security market over the short term as well as long term. The report is a comprehensive presentation of trends, forecast and dollar values of the global cyber security market. According to the report, the global cyber security market is projected to grow at a CAGR of 15.2% over the forecast period of 2018-2024. The internet has become an essential part of today’s generation of people from communicating through instant messages and emails to banking, travelling, studying, and shopping. The Internet has touched every aspect of life. Owing to increased use of the internet by people, protecting important information has become a necessity. Cyber security is the practice of guarding systems, networks, and programs from digital attacks. These attacks are usually aimed at retrieving, altering, or destroying sensitive information, extracting money from users and disturbing normal business processes. Moreover, increasing use of smart devices and internet of things, the cyber attackers are growing innovative and are making the IT security more accessible to malpractices. Hence, this gives the rise to cyber security industry to play a very prominent role in the daily lives of every person. The emergence of disruptive digital technologies such as the internet of things across various industry verticals drives the growth of the cyber security market. In addition, the government sector is more prone to cyber-attacks owing to the presence of government records that are packed with traffic documents and proprietorship statistics. The perception of eGovernance has headed the government to focus more on information security threats. This, in turn, is strengthening the growth of the cyber security market. The global expenditure on cybersecurity is increasing as it is becoming difficult to keep pace with the rise in cybercrimes and malware attacks on governments, BFSI and healthcare organizations. Airplane navigation and guidance systems can be highly susceptible to cyber-attacks that can have widespread complications. Hence, the computers and networks for all the ground and air-borne tasks need strong security infrastructure. On the other hand, the primary platform for an increase in cybercrime activities is connectivity through the use of Big Data, cloud, social media, and mobile services. However, the use of pirated and open source cybersecurity solutions are curtailing the market growth over the forecast period. Furthermore, implementation of the artificial intelligence and the advancement in the blockchain technology for cyber defense have opened several doors of opportunity for the key players in the cyber security market. For instance, third-party data packing and cloud-based services have opened opportunities for a cyber-attack which formerly did not exist. These services operate on the support of the internet and will become increasingly connected over the upcoming years, allowing the need for a robust cyber security system in the business environment. Among the geographies, North America dominated the cyber security market. The growth in the North American region is due to the strong presence of several market executives along with recent security threats. Moreover, the total number of cybersecurity incidents reported by federal agencies in the United States has drastically increased from 5,503 in 2006, to 77,183 in 2015. Furthermore, the rising need among organizations to shrink the misuse of internet and address the attacks on their IT infrastructure is anticipated to drive the cyber security market in the North America region. Moreover, rapid economic growth and economic stability are expected to drive the growth in the Asia Pacific region. Chinese and the Indian government are working on deploying a robust and credible cyber security policy and action plan which is anticipated to reduce the impact of cybercrime in the region. The report on the global cyber security market covers segments such as deployment mode, security type, services, solution, and end user. On the basis of deployment mode, the sub-markets include on-premise and cloud. On the basis of the security type, the sub-markets include application security and cloud security. On the basis of services, the sub-markets include professional services and managed services. On the basis of the solution, the sub-markets include risk and compliance management, distributed denial of service (DDoS), and unified threat management. On the basis of the end user, the sub-markets include manufacturing, it and telecom, public sector, healthcare, and aerospace and defense. The report provides profiles of the companies in the market such as Trend Micro, Fortinet, Inc., Cato Networks, Palo Alto Networks, Inc, F-Secure, Juniper Networks, and Symantec. The report provides deep insights into the demand forecasts, market trends, and micro and macro indicators. In addition, this report provides insights into the factors that are driving and restraining the growth in this market. Moreover, The IGR-Growth Matrix analysis given in the report brings an insight into the investment areas that existing or new market players can consider. The report provides insights into the market using analytical tools such as Porter's five forces analysis and DRO analysis of cyber security market. Moreover, the study highlights current market trends and provides forecast from 2018-2024. We also have highlighted future trends in the market that will affect the demand during the forecast period. Moreover, the competitive analysis given in each regional market brings an insight into the market share of the leading players.